Things were quite easy to understand from a support perspective in the pre-Windows 10 age. If you installed Windows on a PC or bought a PC with Windows pre-installed, you could be certain that you could run it until Microsoft ended support for the operating system. Upgrades to newer versions of Windows were possible as well, and if an upgrade was supported, you could be certain that you could run the new operating system version on the device for the remainder of its support phase. Microsoft cut off very old hardware at times, but most of the time, you could install a new version of Windows on a PC with relatively old hardware. You may not have had the best experience using the operating system, but you could run it. This changed with the release of Windows 10. Windows as a Service is a fundamental change; while all versions are called Windows 10 that Microsoft releases twice a year, each may change what is supported and what is not. This means that owners of Windows PCs may be stuck on a particular release version of Windows 10. This would not have been an issue on earlier versions of the operating system, as it would still be usable until Microsoft ended support for it. With Windows 10, it means that support will run out after less than 2 years. Support end means that users are stuck eventually on an unsupported version of Windows that won't get security updates anymore. It also means that users cannot upgrade the system to a newer version of Windows. What's left then is to either restore an older version of Windows if still possible, or switch to a Linux distribution. Microsoft is aware of the dangers, and reacted quickly when some Windows customers started to report that they could not upgrade their devices to the Windows 10 Creators Update. Windows Update displayed "Windows 10 is no longer supported on this PC" during setup, and refused to continue the installation of the upgrade. Devices that are equipped with Intel's Clover Trail silicone are blocked from being upgraded from the Anniversary Update version of Windows 10 to the Creators Update version (and any future version). Microsoft solution for this was to extend support for the Anniversary Update of Windows 10 until 2023. Support means that affected devices will receive security updates but no new feature updates. Intel dropped support for the silicon which it introduced when first devices with Windows 8 were released. These devices ran Windows 8 initially and many were upgraded later to Windows 10 by customers taking advantage of the free upgrade offer. Both companies are to blame partially for the fiasco; Intel because it dropped support for processors after a relatively short period of time of availability, and Microsoft because it designed Windows 10 this way. It is interesting to note that Microsoft's main reason for blocking the update on these devices is that performance would potentially be impacted on these devices. Consumers are on the receiving end when it comes to this as uncertainty is added to the purchase of Windows devices or hardware components. Will Windows 10 support the hardware components until 2020 or 2025? How will Microsoft react then? Will it provide security updates for the latest supported version of Windows 10 on these devices as well? Which hardware may cause incompatibilities with new versions of Windows? Processors? Graphic cards, hard drives, motherboards? PC World author Mark Hachman suggests that any component that is not supported any longer by its manufacturer may block future Windows 10 upgrades. Microsoft confirmed late Wednesday that any hardware device that falls out of the manufacturer’s support cycle may be ineligible for future Windows 10 updates. While it is fair to say that most desktop computers won't run into compatibility issues with future versions of Windows 10 if they run Windows 10 already, there is a chance that some hardware will become incompatible eventually. We are talking about an eight year period as Microsoft guaranteed support until 2025 at the very least, and a lot can happen in eight years. Windows 10 devices may not be compatible with future version upgrades of the operating system if hardware manufacturers drop support for components. What would you prefer? Unsupported Windows 7 or Windows 10 which has more support until 2023(security) for the unsupported CPUs? Wtf is wrong with your brain people? “Microsoft won’t support this CPU – omg uncertainty – better install Windows 7 which has more security holes and its support will end earlier than Windows 10”. Clowns, that’s what you are. Windows 7 is not unsupported. Windows 7 gets extended support, which means security updates, until January 14, 2020. 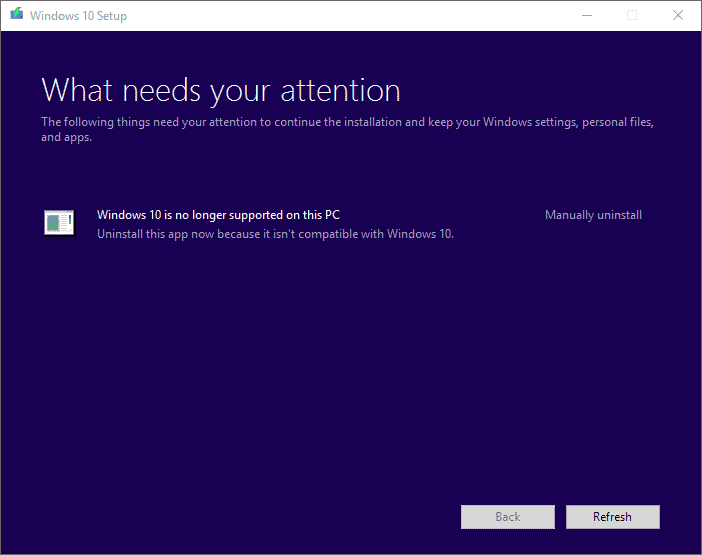 Windows 10 15063 is supported even further… What’s your point? In the case of my netbook, which is used solely as a video surveillance recorder, Windows 7 will be supported until January 2020. Windows 10 would be dead by then,on said device. I’m glad I kept Windows 7 on all of my work machines. Microsoft has been a bit sleazy about Windows 10 from day one. Uninformed at least, that’s what you are. Win 10 is supposed to be supported by M$ for 10 years, ie until 2025. Now, some Win 10 may reach EOL long before 2025 mainly because M$ have forced twice-yearly upgrades upon Win 10 users, which may cause some OEMs to stop supporting new Versions of Win 10 for their devices which are about 4 years old, ie affected Win 10 computers can no longer upgrade to the next Version. Previously, most OEMs had no problem supporting new versions of Windows for their devices which are more than 4 years old because the time interval between version upgrades was about 3 years, eg the 2006-released Win Vista was upgraded to Win 7 in 2012. From 2009 onward, Win 7 could run on most computers that were more than 5 years old, ie a computer made in 2004 or earlier could run the 2009-released Win 7. ……. With Win 10, the time interval between Version upgrades will be about 6 months, eg Version 1511 to Version 1607(Anniversary Update) to Version 1703(Creators Update) is 8 months. … correction …. was upgraded to Win 7 in 2009. ……. I suppose Intel is now interested in following greedy M$…Intel hardware as a service. If anyone is old enough you’ll remember when Microsoft announced it was going to offer 10 years of support, something unheard of at the time when 3 years was standard, everyone said at the time how a 10 year life cycle would either bankrupt them or be reduced. It may have taken 20 years for them embrace, extend, and extinguish their competitors in the desktop market but finally they’re there and are now free to treat customer however they like. THAT is a feature by itself! THAT is a desired feature, keep the spyware, feature flips & SaaS trappings off MY computer. Thx. I can see hardware manufacturers deliberately not making drivers available for newer versions of Windows, exactly because they know people will need to buy new computers to continue receiving OS updates. Therefore I can see this being a very real problem in the future and it will be outside of Microsoft’s control as there’s nothing they can do to force hardware manufacturers to update their drivers. This isn’t a problem exclusive to Windows, I remember quite a few iPad’s for example stopped receiving updates around a year ago because IOS 10 doesn’t support them anymore. I can guarantee lots of people will still be using those devices, completely clueless that they may have unpatched security vulnerabilities on their device. It feels like we’re going backwards. I wonder how businesses are planning to tackle this problem? It will be a bit concerning to be faced with the problem of suddenly needing to replace a few thousand computers because the hardware isn’t compatible anymore. Before last year I never really used Linus but since I use it and experiment with it regualrly, I’m on Win7 on my main computer and will upgrade to 8.1 for the 3Years of “bonus” but after that I will go full Linux if nothing has changer with M$. Moreover some where telling me “I’ve heard with Linux that there is no virus”…. so there will be more and more casual users in the next 10 years on Linux. The industry has been evolving (albeit slowly) since the days of CPM (before DOS1.1). Problems like these have always been with us. In an era of planned obsolescence, where products are built to fail on a schedule so that sellers can force the market to sustain desired profit margins, Microsoft is just playing the same game. My four machines (2 desktop and 2 laptop) will continue to run Windows 7 until the machines die (and I have enough spares to keep them rebuilt for a very long time). The consumer will force the market to change, just like they always do. Microsoft will have to refine their policies, just like every other large corporation. The short term pain we all feel is also normal and will pass. I can keep my Windows 7 operating safe by utilizing the best security software available to insure attackers have a very difficult time seeing me. In addition, I do not venture into the web sites that are notorious for bad behavior. Oh, thanks for all the comments I read on Ghacks. They are proof that we are aware of the sleazy practices Microsoft (and others) presently employ and that awareness will accelerate the changes needed to fix our world. When you use a new or old(= upgraded from Win7/8.1) Win 10 computer, you are forced to upgrade to new Versions twice a year, in order to stay current/supported or not be prematurely EOL-ed by M$ because each new Version of Win 10 is only supported by M$ for about 18 months. ……. If for whatever reason, your Win 10 computer could no longer be upgraded to the next Version, your Win 10 stucked-Version will risk being EOL-ed by M$ in about another 12 months, eg running a 4 to 5 years old hardware device that is no longer supported by the OEM in terms of issuing new Win 10 Version drivers. This will not be a problem if M$ extend LTSB support to all such affected Win 10 computers, like what they just did for Intel Atom Clover Trail tablets. Time will reveal all things. Who on earth equates anything that MS does with user security? I don’t – wouldn’t dream of using any Windows variant without 3rd-party security and personal oversight of MS telemetry. Windows isn’t open to the four winds by accident – it’s always been designed that way. What is it you don’t understand about the words ‘goose’ and ‘golden egg’? Yes – I might well feel pushed by planned obsolescence into replacing my computer before its hardware is unviable. But if my ‘ABC’-branded device tells me it’s non-viable for Windows after just a couple of years, then the replacement device is going to be from ANY manufacturer that ISN’T you. Get it? Or am I going too fast for you? Not talking about whose fault it is, but about foreseeable market reactions. To everyone – there’s still Linux – and it’s seems to be a more viable option every year. The closest you’ll probably get is this forum post because for obvious reasons Microsoft don’t like negative press. I guess Win 10 users will find out – and Microsoft doesn’t want you to know this – that there is no problem running an unsupported OS. The sky does not fall. Aliens do not invade your PC. And strangers do not hold your computer for ransom. My first thought when I started reading this article was that Microsoft was about to go into the computer hardware business. They started with an OS that quickly makes your hardware obsolete. Then they fix it so you can’t update the OS unless you buy a new computer, and on, and on, and on. Think what this means to businesses. This would be the preferred model IMO, Security Updates only for all Windows 10 versions, the only question in my mind is what about bugs and issues non security related? One of the big drawbacks of Windows 10 is that at the rate of development of 2 releases a year + all the other reworking of internal code + the poor garbage collection of removing some things (like Sidebar gadgets and other components that left much dead code behind in source) means a pretty buggy OS for the power users (most everyday users are light users and wont ever notice some issues). This means that OS maturity is poor, and if the extended support also meant bug fixes, this would mean a more stable OS, however if only security updates are pushed, while resolving the immediate security concerns it still doesnt resolve the main issues. Other thoughts: Microsoft and its Windows 10 policies are paradoxical at best, they force updates via liveupdate claiming that the OS security is breached due to users not installing (security) updates, yet they ship flashplayer as a non removable component which is one of the biggest security flaws in the history of security flaws. IMO this alone shows that what MS claims about any given aspect and what reality is are two separate things and most users just take swallow hook line and sinker because sadly they dont know any better. It really depresses me when I think about the future of Windows as an OS and what people like me who like Windows 7 the most and have no intention of ever using Windows 10 ever again will do. What’s even more depressing for me is that I’m a gamer and some of the games I play simply will never run on Linux, because even Wine can’t get past the anticheat of some F2P online games. I’ve tried Windows 10 a couple of times, telling myself I won’t be bothered by small things and will just use it for gaming and stuff, never fiddle with settings and such, but it always happens that after a week of using it I get so angry and frustrated with it I immediately install Windows 7 on top. Why are Microsoft spending resources for Windows 10 developing a wallpaper of an ninja cat riding a raptor or adding support for emojis?! Those are childish things and add nothing to the ease of use for Windows 10. Are they mocking their customers? I really don’t know what to think, but Windows 10 depresses me and makes me feel like being a Jew in Nazi Germany. Comment of the Year! Thank you, you helped me decide my next OS on my new build…Linux. I’ve been trying hard to look for ANY good reason to stay with Windows. Win 10 = no hope. I can see that now. Only M$ think that suckers need to upgrade Win 10 to new Versions every 6 months. An OS just runs a computer device, similar to the electronics needed to run TVs, microwave ovens, washing machines, modern cars, etc. TV technology advanced from Black & White CRT(1950s) to Color CRT to Color CRT with Remote Control to LCD to LED with HD video to large screen LED and to the present-day OLED. In between, it took about 10 years interval, ie people only really needed to buy new TVs about once every 10 years because of advances in technology. ……. So, similarly, there is no real need for a new computer OS until after about 5 years of technology advances. New features like Cortana, Edge, Bing, Windows Defender, Paint 3D, etc can be installed as Apps/programs if needed by the users. You’re lucky you don’t live in the Netherlands and do online banking. Banks here block access to online banking if the OS ceases to be supported.